Lake Garda, magnificent villa on the lake in the prestigious village of Sirmione. Ground floor: large living room with fireplace, separate kitchen, study, bedroom, bathroom, large porch with direct access to the garden. First floor: 4 bedrooms, 3 bathrooms, large closets, terrace with wonderful views. Basement: large storages, technical rooms, laundry. Sauna. Possible access to thermal water. Swimming pool. Boathouse. Magnificent villa recently renovated, surrounded by a large garden. Magnificent view. A few minutes from Como city. Basement: tavern, bathroom, utility room. Ground floor: living room, sitting room, kitchen, bathroom, closet, balcony. First floor: large master bedroom with double closet and bathroom, bedroom, bathroom. Furnished. 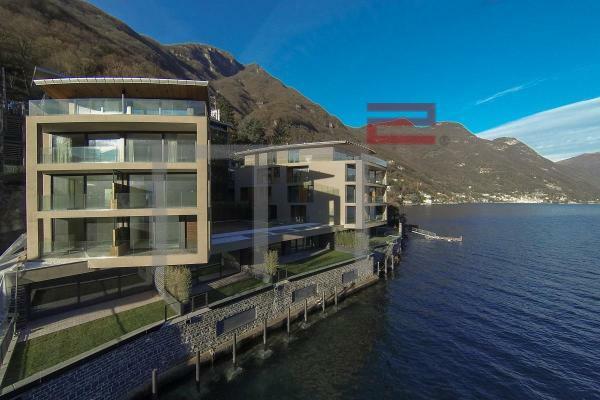 Lugano Lake, beautiful villa in Valsolda with magnificent views of the lake and mountains. On the ground floor: double garage, laundry room, 2 bedrooms, bathroom with shower and tub, billiard room, sauna with shower and bath. First floor: wonderful main entrance, large living room, dining room, study, modern and functional kitchen, master bedroom with bathroom, guest toilet, large cinema room, 3 terraces. Luxury finishes. Private garden, utility room, swimming pool. Alarm system. To whom this may concern: The villa is located on the border between Switzerland and Italy, close to the center of Lugano, 20 minutes by car far from this big city of canton Ticino. Ideal for permanent residence for families who is working or studying in Lugano. New modern resort on Lake Como with pool, private beach and boathouse. The architectural quality guarantees that the building performs to a high level, resulting from both a careful selection of materials and research into the building technologies used in the project. The design of the building’s envelope and fixtures render its construction perfectly “contemporary” and in line with passive homes typical of sustainable architecture, with attention paid to energy consumption and reducing emissions. A building culture for contemporary homes, which combines sustainability, drastic reduction of energy costs and a perfect climatisation of the rooms. The intervention also takes care of the area in environmental terms, through the planning of green spaces, which are fundamental for the project to be a success. The planting of botanical species, starting with local varieties, is being studied, and using greenery to hide the service areas is foreseen, to leave the building as natural a backdrop as possible. At lake level, up to the same height as the adjacent boathouses, there is access from the water. A typical element of the architecture of Lake Como, the boathouse is situated underneath the building. The entrance, positioned to the south, is protected by a wall, needed to shelter it from northerly winds. The special feature of the boathouse is that it will “dry store” boats; one can, therefore, using an elevator system, reach an upper level designed to store owned boats without disembarking. There will be ten spaces for boats. There will be a connection from the boathouse to the residential floors and car park above through a central lift. The adjacent private beach is a further added value of the resort.